Injured McClain senior Maddy Stegbauer takes her final shot as a Lady Tiger from the free throw line on Saturday at McClain High School after Hillsboro Head Coach JR Moberly intentionally gets called for a technical to allow her the opportunity in the Lady Tigers home game against the Lady Indians. McClain’s Dalton Mischal explodes to the rim for a layup over Hillsboro’s Brad Miller on Saturday at McClain High School where the Tigers took on the Indians in a cross-county and FAC rivalry matchup. GREENFIELD – Saturday, February 9, McClain High School hosted the Lady Indians and Indians for a day filled with basketball games between the cross-county and Frontier Athletic Conference rivals. In the girls varsity matchup the Lady Tigers beat the Lady Indians 55-42. In the boys varsity game the Tigers completed the sweep with a 52-34 victory. Despite the rivalry matchup sportsmanship was ever present in the Lady Tigers and Lady Indians game. Injured senior Maddy Stegbauer, who has not played since the Lady Tigers’ Dec. 12, 2018 win over Huntington, got to start in the game and received the opening tip when Hillsboro’s girls vacated mid-court in a pre-arranged moment to honor the injured senior. Hillsboro Head Coach JR Moberly went above and beyond with 45 seconds to play in the game when he asked for and received a technical foul that gave Stegbauer the opportunity to enter the game and shoot the two free throws. Stegbauer was unable to convert at the stripe but the moment was special none-the-less and displayed the class of Hillsboro’s Lady Indians and their head coach. The Lady Tigers came out in the first quarter with great intensity as they quickly built a double digit lead with a balanced scoring attack and relentless defense that held the Lady Indians to just four points with 49 seconds to play in the quarter and secured an 18-6 lead as the teams prepared for the second quarter of play. Kelli Uhrig and Kyla Burchett led the Lady Tigers with five points apiece in the first quarter and Bryn Karnes had four points while Macie Adams and Liz Kegley rounded out the scoring for McClain with two points apiece. 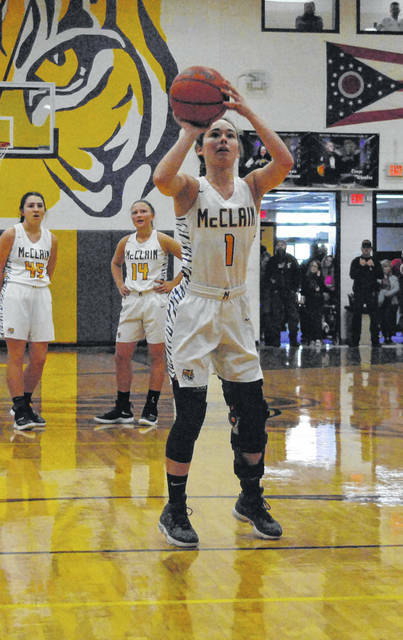 McClain continued to pile on at the start of the second quarter when they recorded nine of the first 11 points of the quarter and took a 28-8 lead that prompted coach Moberly to call a timeout with five minutes to play in the first half. The timeout did little to slow the Lady Tigers as they scored seven more points over the final five minutes of the second quarter but, it did serve as a turning point for the Lady Indians who recorded five of the seven second quarter points over the same span with McKenzie Cosby and Gracie Dean finding the bottom of the net for Hillsboro to make the score 35-13 at the halftime buzzer. The Lady Indians continued their resurgence in the third quarter and started the quarter with an 11-4 run that saw the Lady Lions lead chipped down to 15 points at 39-24 with 3:30 to go in the third. Kayden Watson, Kelsey Burns, Cosby, Karleigh Hopkins, Dean and Lana Grover all contributed during the run. The Lady Tigers found a groove late in the third quarter and had a 5-4 advantage over the closing minutes of the third that provided a healthy 45-28 lead. Hillsboro again was able to outscore the Lady Tigers in the fourth quarter of play with a 14-10 advantage in the final fram but it was not nearly enough to pull off the comeback as McClain was able to secure the victory at the line and set up the moment of the night. In the nightcap the Tigers were able to secure the varsity sweep with a 52-34 win that was not secured until McClain scored 12 unanswered points over a two minute span from 2:50 to play until only 50 ticks remained on the scoreboard. A three pointer by Tigers’ senior Trevor Newkirk capped the scoring for McClain and put the finishing touch on the closing 15-4 run that finally decided the game between the cross-county and FAC rivals. The Indians started the game strong and took an 11-6 lead on Ryan Scott’s third three pointer of the game to go with a highlight steal and fast break layup that accounted for all of Hillsboro’s points in the quarter. McClain’s Dalton Mischal cut the lead to two points with a three pointer of his own and the teams settled for a low scoring 11-9 game at the end of the first quarter. McClain’s Ethan Cockerill tied it at 11 when he hit two free throws at the 7:08 mark of the second but, Scott answered with his fourth three pointer of the game at the 6:46 mark to put Hillsboro back on top. A steal and layup by Mischal was followed by a layup on the other end by Hillsboro’s Brad Miller that pushed the Indians’ lead to three points at 13-16 where it would stay over the next three plus minutes as the Tigers and Indians locked down on defense. After two timeouts by McClain the drought was broken by Cockerill with 1:32 to play and the Indians clinging to a 16-15 lead on the road. Two missed free throws by Ethan Watson with 1:14 to play before half energized the already hyped crowd that became even more frenzied when Tiger senior Kobe Penwell hit a three pointer to give the Tigers their first lead of the night at 18-16. Mischal capped the second quarter with an offensive rebound and putback that resulted in a foul with one second on the clock that gave the Tigers a four point halftime lead at 20-16 despite missing out on the three point play. 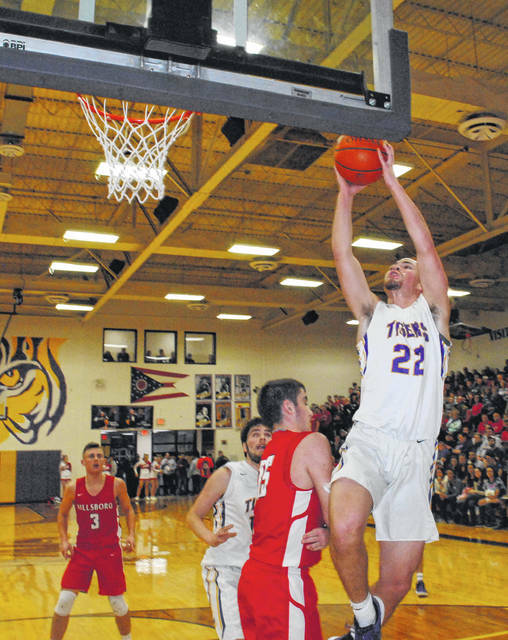 The Indians continued to struggle in the third quarter while the Tigers flexed their muscles on offense and defense with Mischal leading the way on both ends. McClain opened the third quarter with a seven to two run that saw Mischal contribute three points while Devin Carter and Cockerill had two each as the Tigers pushed their lead to nine points at 27-18. After a timeout by the Indians Cockerill immediately answered with a three pointer to push the lead to double digits as the Tigers began to pull away. Mischal finished off the third with five straight points for McClain as they outscored Hillsboro 15-5 in the third and took a 35-21 lead into the final frame. Hillsboro was able to get to within nine points over the first four minutes of the fourth quarter before the Tigers initiated their closing run. Scott hit his fifth and final three of the game at the start of the fourth and Watson hit two free throws while Miller chipped in four points on a putback and layup before the Tigers iced the game.